It’s been way too long since I have posted updates to this site. So, what’s new?? Well, for one thing there is a new member of the Peters household. Caleb Reed Peters was born on April 18th. The “big kids” are very excited about their little brother. But, as you can imagine, things are pretty crazy lately. So, not quite so much time for blog posts. 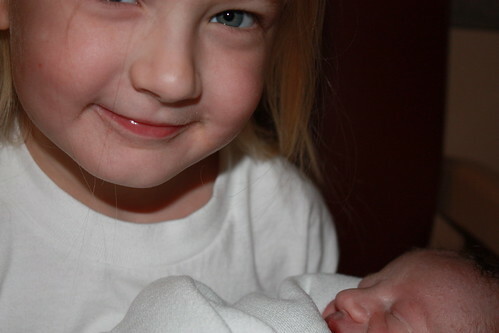 The above picture is Emma holding her new baby brother. For more baby pictures, head on over to our family blog. And work has been pretty busy as well. Never mind the fact that Hertz announced that they were going to acquire us. Then, only a week later Avis announced that they would pay even more. Day to day work hasn’t really changed at all since then, it’s all business as usual. But I have been in the middle of several big projects that have been keeping me very busy. So, things are crazy right now, but more blog posts are coming. I’m working on at least one more post in my Software Estimation series, and I have posts started on several other subjects.